The perfect place to start exploring is Kathmandu Durbar Square, the traditional heart of the old town. The city’s kings once were crowned and ruled from here and while many of its beautiful buildings and temples were reduced to rubble during the earthquakes of 1934 and 2015 some of its traditional architecture, mainly dating back to the 17th and 18th centuries, is enduring and the area has reopened to the pubic. To the north of Kathmandu Durbar Square you’ll find the bustling backpacker district of Thamel and, to the south, the Bagmati River and peaceful Patan district. 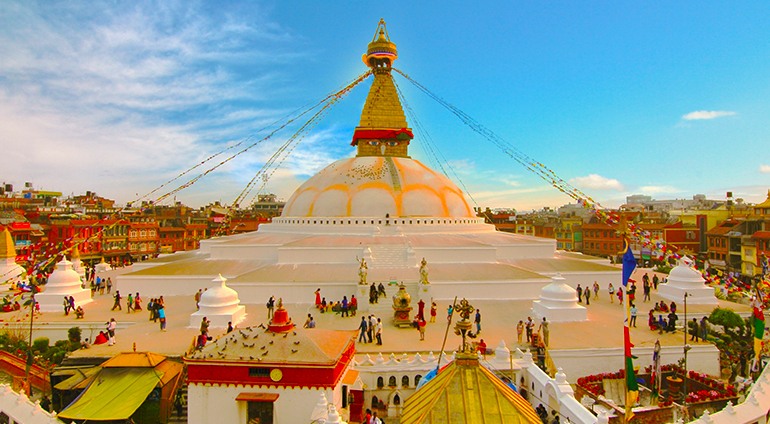 Possibly Kathmandu’s most popular sight to visit is Bodhnath Stupa. An important place of pilgrimage and meditation for Tibetan Buddhists and local Nepalis, it was built sometime after AD 600, when the Tibetan King, Songtsen Gampo, converted to Buddhism. A beautiful spot in the day, its whitewashed domes and gilded tower is even better at night, when it’s lit by thousands of butter lamps. A journey up to the Buddhist temple and Unesco World Heritage Site of Swayambhunath is also a must. Known as the Monkey Temple due to the hundreds of holy monkeys that live in parts of the building, it soars above the city and offers atmospheric 360 degree views across the city and the mountains beyond.